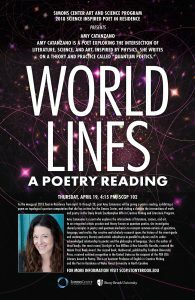 As the inaugural 2018 Poet in Residence of the Simons Center for Geometry and Physics at Stony Brook University from April 16 through 20, poet Amy Catanzano will be giving a public poetry reading, exhibiting a poem on topological quantum computation that she has written for the Simons Center, and visiting a class on the intersections of math and poetry in the Stony Brook Southampton MFA in Creative Writing and Literature Program. She will be joining Robert Crease, Chair of the Philosophy Department and historian of science at Stony Brook University in the reading on April 19. Amy Catanzano is a poet and cross-genre writer who explores the intersections of literature, science, and art. In an integrated artistic practice and theory known as quantum poetics, she investigates shared principles in poetry and quantum mechanics to reinvent common notions of spacetime, language, and reality. Her creative and scholarly research spans the history of the avant-garde and contemporary literary and artistic subcultures in parallel to physics and its under-acknowledged relationship to poetics and the philosophy of language. Catanzano is an Assistant Professor of English in Creative Writing and the Poet in Residence at Wake Forest University in North Carolina. She holds a Master of Fine Arts degree from the Iowa Writers’ Workshop at the University of Iowa. She is the author of three books. Her most recent book, Starlight in Two Million: A Neo- Scientific Novella, received the Noemi Press Book Award. Her second book, Multiversal, published by Fordham University Press, received national recognition in the United States as the recipient of the PEN USA Literary Award in Poetry. Prior to this honor, Multiversal was selected by Michael Palmer for the Poets Out Loud Prize. Her creative work has been published widely in literary journals such as Conjunctions, Denver Quarterly, and New American Writing. Her essays on quantum poetics appear in Poems and Poetics; Jacket2, the online journal of modern and contemporary poetry and poetics at the University of Pennsylvania; and elsewhere. A digital poem on wave-particle duality, made using 3D Editor software, appeared in an exhibition, The Gravity of Words, at the Rotterdam Poetry International Festival and the Oslo Poesifilm Festival for Digital and Visual Poetry. In addition to regularly giving poetry readings and talks on the intersections of poetry and science, she conducts creative and scholarly research at scientific research centers, including a recent trip as an official visitor to the European Organization for Nuclear Research (CERN) in Switzerland with the support of an Arts and Humanities award from Wake Forest University. Simons Center Gallery hours: Monday- Friday 12:00 – 5:00 pm, and by appointment. Directions to Simons Center for Geometry and Physics: http://scgp.stonybrook.edu/about/directions For more information visit http://scgp.stonybrook.edu or call 631-632-2800. The Simons Center Gallery’s goals include hosting the highest quality and most intellectually inquisitive art by internationally acclaimed artists working at the intersection of art, science, and technology. The exhibitions and events at the Simons Center for Geometry and Physics at Stony Brook University feature artistic and scientific concepts accessible through a broad range of media for meaningful experiences that ignite imagination and inspire ideas.